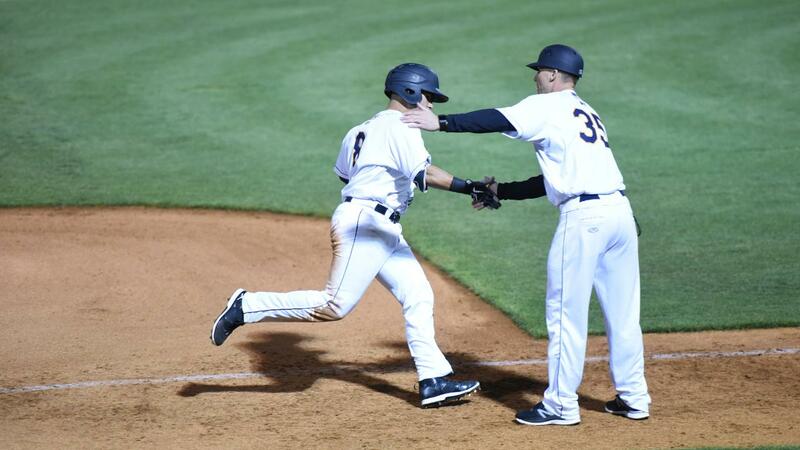 CHARLESTON, S.C. - After two consecutive series losses, the RiverDogs desperately needed something to break in their favor. That break came not a moment too soon in the series-opener against the Greenville Drive Monday night in front of 3,850 at Joe Riley Park. A career night for first baseman Mickey Gasper led the way for Charleston's skid-snapping 6-2 victory over the Greenville Drive. Gasper took four trips to the plate, and reached successfully in all four. In the first, he reached on a one-out walk and scored one of three first-inning runs. In the third, he lined a leadoff double to left but was stranded on third. In the fifth, again leading off, he lined a single to center and came around to score on Canaan Smith's sacrifice fly, and for this fourth plate appearance of the night he crushed a 2-2 pitch over the wall in right-center field for his first home run of the season. Overall, Gasper finished the night 3-for-3 with a walk, three runs scored and an RBI. This offensive outburst by the catcher/first baseman was a welcome boost as the Charleston (6-6) club was mired in an offensive slump that has only seen seven runs in the last 36 offensive innings on this homestand entering play. Gasper's three hits contributed to a total of 13 on the night for Charleston, one shy of the team's season high. His third career three-hit game raised the Bryant University product's average to .393 (11-for-28) for the season. Starter Alexander Vizcaino (1-0) provided the Dogs' longest start since Roansy Contreras' five-inning effort April 10 against the Asheville Tourists. Vizcaino allowed only two runs on four hits, and struck out nine. It was his second time in as many starts with at least seven whiffs. It was a dog lovers' paradise at the ballpark for the first Dog Day Monday, as fans were encouraged to bring their pups to the game as part of Game of Bones night at Joe Riley Park. Water bowls were all ready for the dogs set up throughout the concourse, and their owners enjoyed $1 beer and $1 hot dogs presented by Busch Light during a perfect night at the park. The RiverDogs continue their three-game series with the Drive, sending right-hander Roansy Contreras (2-0, 2.70) to the mound for the start in Game 2. Contreras, in search of his third win of the season, has enjoyed a good start to his season. In two road starts in Columbia and Asheville, Contreras has allowed three runs in ten innings, striking out nine and walking just two. Opposing Contreras will be Thaddeus Ward (0-0, 2.70), also making his third start of the year. Come on out to the ballpark for Food Lion Live & Local Tuesday in association with 105.5 The Bridge and enjoy live music and take a walk around the farmers' market set up on the concourse!